There are interesting posts on this issue at EJIL: Talk! by Apo Akande and Marko Milanovic. … an Italian Court has convicted 23 American agents (including the former head of the CIA in Milan) and 2 Italian intelligence agents for their part in the abduction and rendition of a muslim cleric Abu Omar. 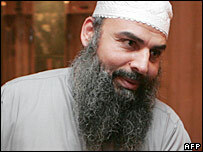 Abu Omar was taken from the streets of Milan to Egypt where he claimed to have been tortured. It was alleged that this act of “extraordinary rendition” was carried out by a team of CIA agents with the collaboration of Italian intelligence agency (…) This case is of interest because it appears to be the first conviction of government agents alleged to be involved in the extraordinary rendition programme. It is also of interest because what we have is a conviction by the courts of one country of persons who are officials or agents of another government. The case therefore raises issues as to the immunity which State officials are entitled to, under international law, from the criminal jurisdiction of foreign States.